Deep in the Purcell Wilderness there is a secluded natural tub. I visited it years ago and it’s a place that I still dream about – the alpine meadows, the scalding water, the incredible views. There are a lot of barriers to getting to Dewar Creek Hot Springs, but if you’re up for the muddy trek, it’s an incredible experience. If you make it, you’ll be deep in hot spring country and even deeper in grizzly bear country – keep it wild. Hot spring season is upon us and it’s time to pack for adventure! 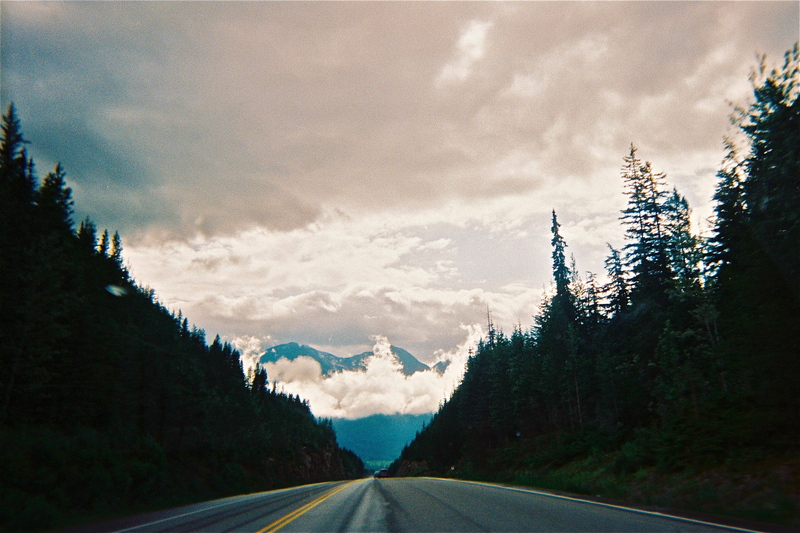 To plan your trip in B.C. or the Northwest the best guide I’ve found is Hiking: Hot Springs in The Pacific Northwest. It is a region by region guide to some of the best and most remote natural hot springs in the world. With area maps, spring descriptions, driving instructions, hiking trails and even the occasional photo it will get you where you need to go. The springs are divided into regions making it easy to plan a trip with as many hot spots as possible. Cell phone reception and 4G in these remote locations is unreliable, so another thing to pack is a Backroad Mapbook. 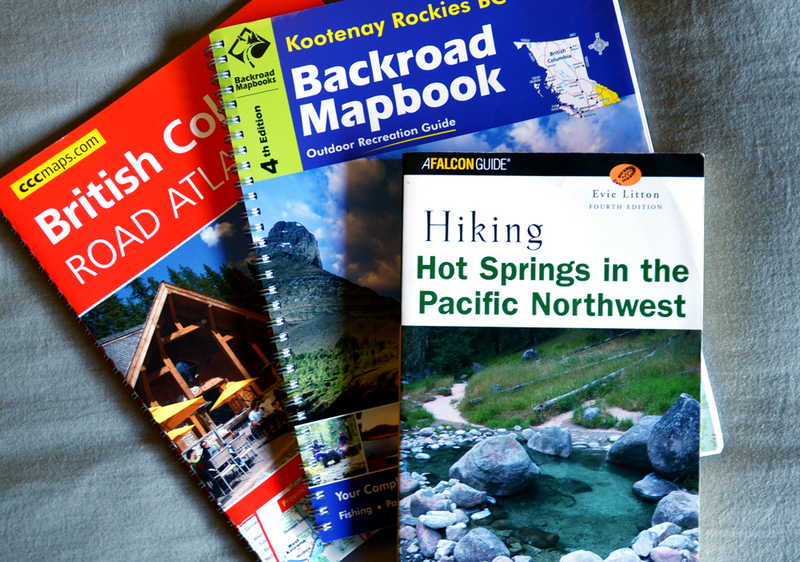 Hot springs can be off the beaten path and these books will show you roads that will not be in a traditional road atlas. They also contain addtional info about camping, hiking trails, GPS coordinates, elevation and other recreation ideas for the area. Though both of these guides may help you find the springs it is always a good idea to call or stop by the local ranger station and ask about road and trail conditions before heading down that backroad. Hot Springs will often change in temperature and flow from year to year and the roads leading up to them can be very poorly maintained. The rangers can tell you what to expect on the road and at the springs this season. They will also be a wealth of information on spring ecology, backroad safety and wildlife. Be safe and have a great soak! Look up, way up, after you drive through the gate at Fairmont Hots Springs Resort in B.C.’s Rocky Mountains. Indian Tubs Hot Springs are the crowd-less way to take the waters at Fairmont. The three personal sized tubs are maintained by the resort, but are free to anyone who wants to take a dip. Even if you would rather use the high diving board at the main pool, they are worth the short climb up the hill just to take in the view. Supplement your next road trip adventure with some soaking in the swimming pool sized hot springs on B.C.’s Hot Springs Circle Route. The B.C. Hot Springs Circle Route is a great road trip adventure. There are well over a dozen springs on the route, which circles the Kootenays between Cranbrook and Revelstoke in Southeastern B.C., Canada. Many of these springs are extremely remote, and though they are alluring, not all of us have the time or the four-wheel drive necessary to go hunting for wild hot springs. Luckily, there are a handful of developed springs that cater to the road-tripping family who like to stay “on pavement.” These resorts are all places to spend a day by the swimming pool or to soak tired muscles in the hot mineral water after a long day of outdoor activity. These hot springs have all played a part in the history and development of the Kootenay region and each has stories of people miraculously healed by the waters. With the price of a soak hovering around ten dollars, they are a fun, healthy and affordable activity. What’s more, the landscape is itself captivating enough that even gazing out the car window as the scenery rolls by between is a satisfying way to spend the day. Below are the Hot Spring Resorts in order if you head south from Revelstoke. Halcyon Hot Springs is one of the more polished resorts on the route with three large pools and a great view. There is also a spa onsite for those who are looking for a bit of extra relaxation. 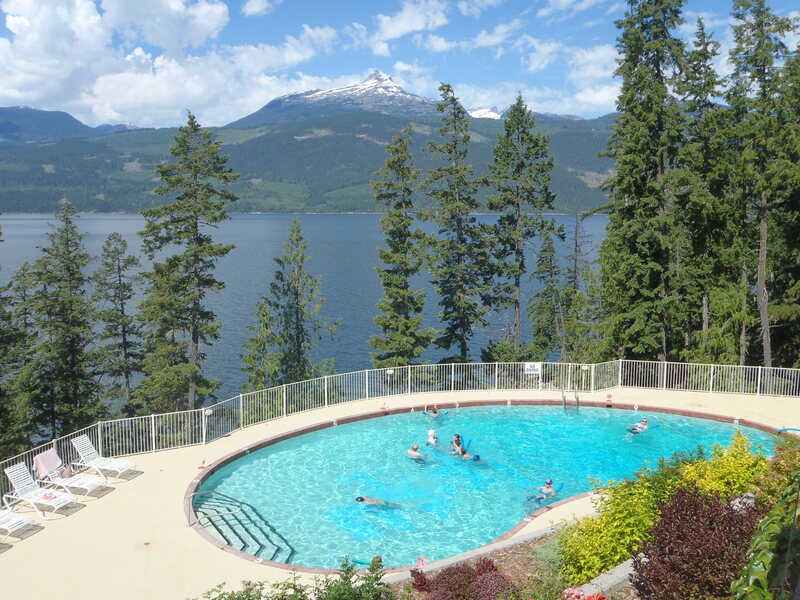 Nakusp Hot Springs has a north-south layout that is perfect for late night stargazing. Nakusp is a good starting point on the route if you are coming from the Okanagan or if you just want to make the area your destination. There are a number of wild hot springs near by and Halcyon Hot Springs is not far away either. Ainsworth Hot Springs are not to be missed. The source of the springs is inside a large horseshoe shaped cave. The cave is completely covered in calcified mineral deposits and assessable for bathers to explore. Fairmont Hot Springs have a wonderland of facilities and activities that sprawl across the landscape. Not the least of which is their massive hot spring pool with a high diving board. 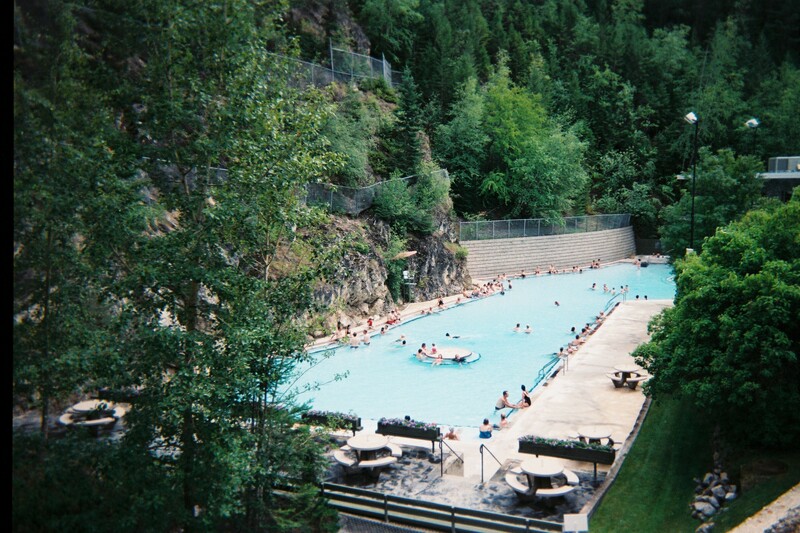 Radium Hot Springs is in Kootenay National Park. The facility is all terraces and walkways that look down into the hot spring pools and span the canyon that the springs are nestled in. Canyon Hot Springs east of Roger’s Pass is truly RV heaven. It’s a perfect stop after a long day of hiking at Glacier National Park. 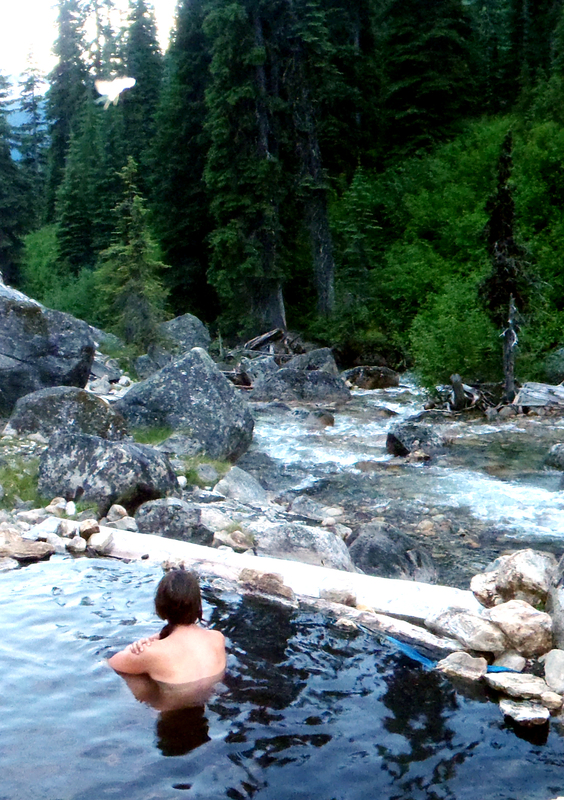 Halfway River Hot Springs are a blissful soak in the Kootenays, just north of Nakusp B.C. They are tucked at the bottom of a steep cliff beside the pebbly Halfway River. These springs lure soakers away from hot spring resorts in the area to soothing mineral water in its own natural setting. In late spring, after the run-off has passed, there are a number of pools at the river’s edge and more permanent soaking pools upstream. Every year the pools and the conditions of the soaking tubs change, but the most enviable spot is always right beside the river. 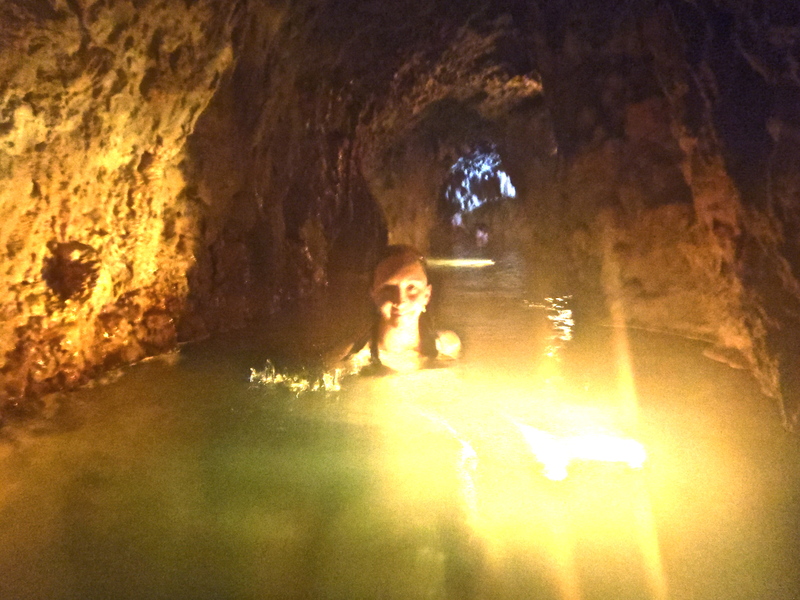 Halfway River Hot Springs are the perfect place to enjoy a quiet day or two. There are places to pitch a tent onsite and further up the road. On weekends you are sure to run into other bathers, but there is always plenty of room for everyone. For industrious bushwhackers looking for an extra measure of quiet or adventure; there are rumors of a hot spring that tumbles down a boulder slide 11km upstream of Halfway River Hot Springs. Pack a shovel. Directions: The forest service road that will get you to Halfway River Hot Springs can be found 26km north of Nakusp. The fork to a flat parking area is at exactly 11.2 km from the highway and just past an ATV track that dives down to meet the hot spring trail. From the parking area follow a path on the left down a steep cliff. The forest service road is best accessed in the summer by four-wheel drive vehicles with high clearance. However, it’s not impossible in very dry weather for less capable cars. Check oil, tires, gas and the weather before embarking and plan on the trip taking a while. A tip from a local: If you are going in the winter bring your snowshoes. You’ll need them as soon as you get off the highway. St. Leon Hot Spring is a wild, slightly sulphurous hot spring just north of Nakusp B.C. and is and accessible option for those who would rather stay away from the commercial springs in the area. The Nakusp area has a number of wild and developed hot springs and is great as a destination or as a stop on the way so something else. At St. Leon there are three soaking pools on a steep hillside fed by hot and cold sources. The pools are all nestled in a rocky outcrop. To get to the smallest and hottest you can climb up the rock with the help of a knotted rope. This tiny pool with a bird’s eye view is filled with piping hot water directly from the source. It is a natural wedge shaped tub with a small stone retaining wall and is perfect for one or two bathers who can take some serious heat. The middle pool is still quite hot. It is very shallow with a rock wall built around it. The biggest pool is a concrete lined pool in the shape of a guitar. It is the perfect temperature for good long soaks. Hot and cold water is piped into the guitar shaped pool and can help you regulate the temperature of your soak. St. Leon Hot Spring has an interesting yet elusive history. Though none of the sources seem to agree on the specifics, the following seems to be the bones of the truth. 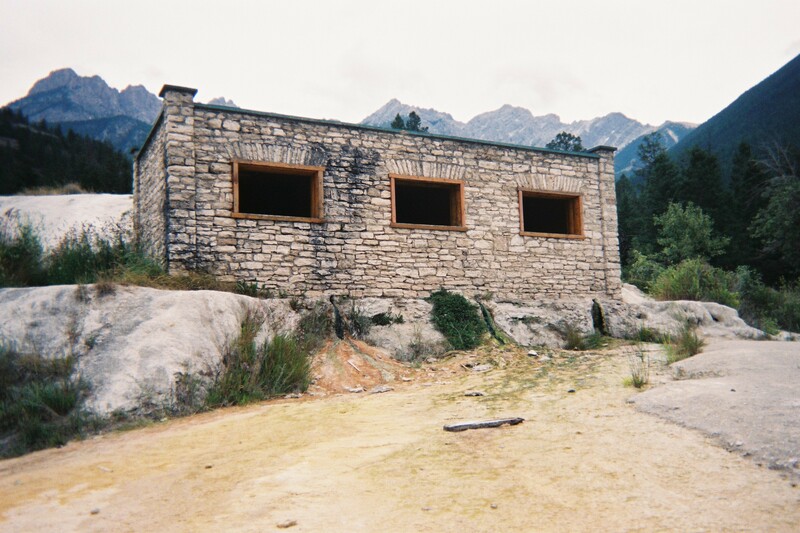 In the early 1900’s there was a hotel built on Upper Arrow Lake (just a few kilometers west of the springs) and water from the pools was piped in. The hotel did well until the war, prohibition and a new rail line reduced steamboat traffic to the resort. It never really recovered and eventually burned down in 1968. A logging company now owns the land, and volunteers from Nakusp maintain the springs. This secluded, yet not so secret, spring has recently been taken out of guidebooks and tourist information centers at the request of the owners in hopes of decreasing unruly traffic at the pools. However, the seven others we encountered there were all return bathers who had known about the pools for decades and were happy to share stories of their own previous dips at St. Leon Hot Springs. They were a colourful crowd, but each had equal distaste for those who besmirch springs and jeopardize everyone’s access. 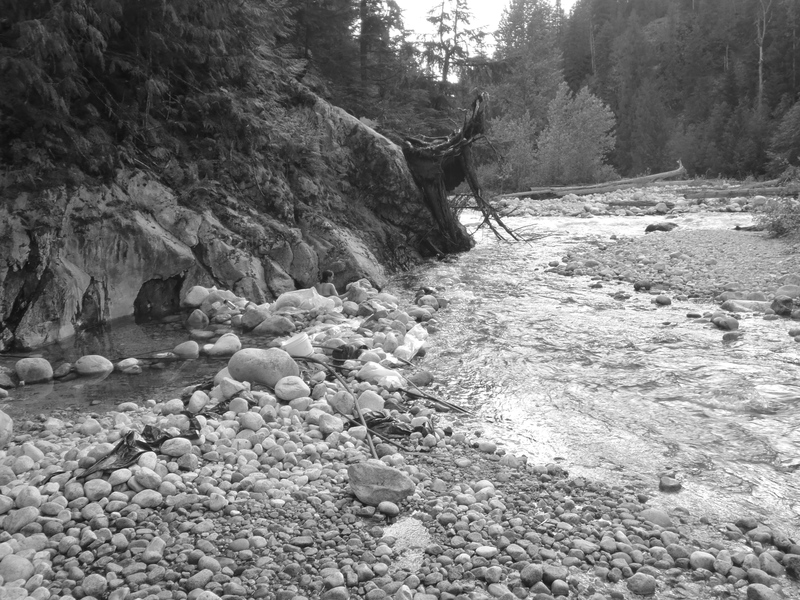 For the time being, the logging company is still allowing responsible bathers use the springs. We can help to continue to make St. Leon Hot Spring (and all hot springs) accessible for bathers by leaving them better off for having been. Click here to read about the problem and how to be prepared and be a solution. UPDATE: In November 2018 I was informed that the springs are under new ownership and asked to remove directions because of vandalism and abuse. I just arrived home after a legendary road trip. 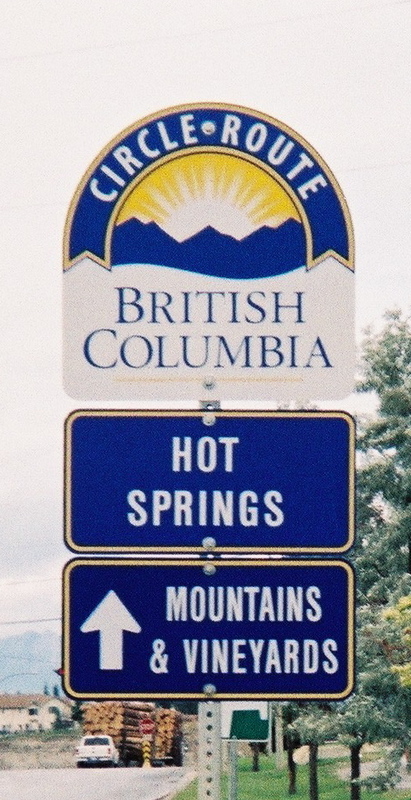 I visited eight hot springs in eight days on the BC Hot Spring Circle Route. There will be plenty of stories and photos to follow.